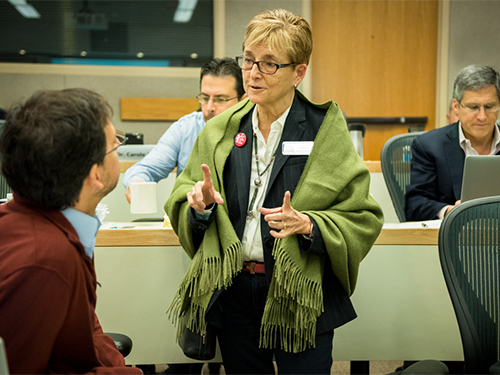 The Heller Executive MBA for Physicians is an accelerated full-time 16-month program designed for physicians who want to improve the clinical outcomes, financial performance, and patient experiences in their healthcare organizations. With its longstanding dual MD/MBA program with Tufts University School of Medicine and executive education offerings in partnership with organizations such as the Physicians Foundation, American College of Surgeons, and the Society of Thoracic Surgeons, the Heller School has a proven track record of bringing the new science of medicine and management to physicians. An accelerated 16-month program that integrates your medical expertise with new knowledge in critical areas ranging from health policy and economics to operations, high performance leadership, and healthcare innovation. A convenient format combining online learning with four 10-day on campus sessions in January 2020, May 2020, January 2021, and May 2021. Top Brandeis faculty, including healthcare experts such as Stuart Altman, PhD. A streamlined application process with no GMAT required. CME credits offered for each on-campus session. Upon completion, you will have the skills to create and lead management initiatives that enhance patient care indicators, improve fiscal insight and bolster organizational strength. The next class begins in January 2020. Apply now!